This post contains affiliate links – a way to make income while keeping content free for you. If you make a purchase from this site, I may make a small commission, but you will not pay anything additional. This cake has always been one of my favorites. It’s one that my grandmother, Myne, used to make when I was a kid. We called it her crock-pot cake, because yes, it actually bakes in a crock pot. 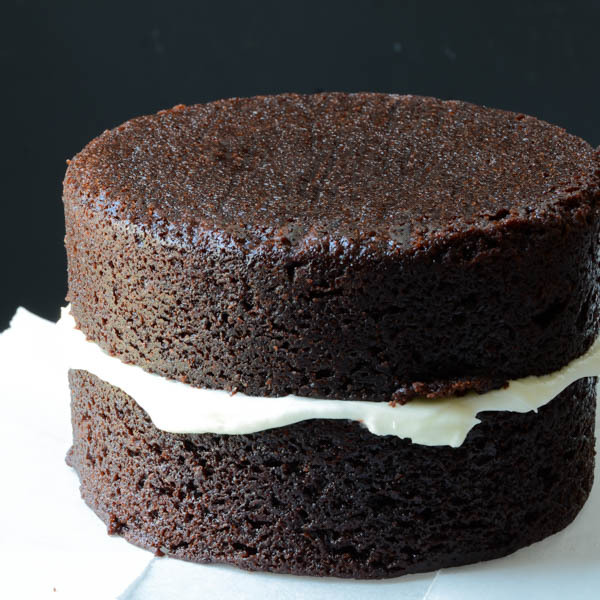 And it produces the most dense, fudgy, and insanely moist cake ever! That’s not an exaggeration. I made this one for my daughter’s birthday and took the liberty of peppermint-ing it up because she has an affinity for mint like a fish has an affinity for water. When I was finished with the cake and admiring its pretty-in-pink ombre icing, I thought it would be perfect for Valentine’s Day! I’m sharing it so that you and the ones you love can celebrate with a decadent slice this weekend. So back to the cake… I’m not sure if it’s the recipe that makes this cake so moist or the cooking method. 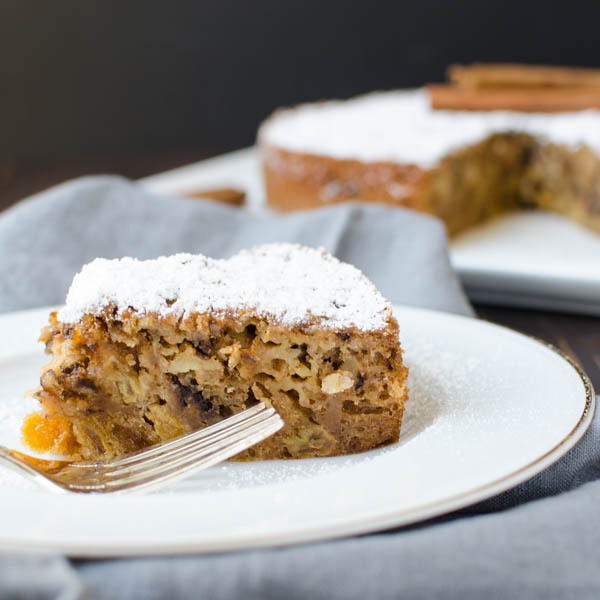 The ingredients include a homemade blender mayonnaise of eggs, oil and other essentials – that would provide a tender crumb to any cake. 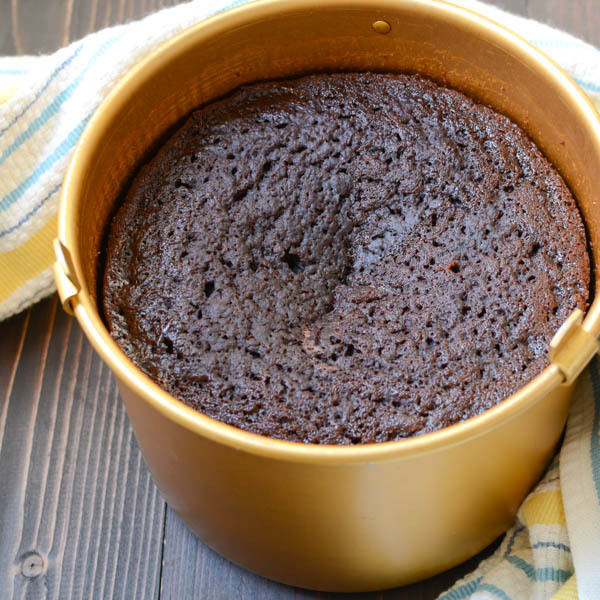 Cooking for 2-3 hours in a crock pot – naturally surrounds the cake with a slow even heat – that creates smaller air pockets, for less drying out. It also prevents a big dome from forming on the top, giving it a more polished look without having to saw off a puffy crown. 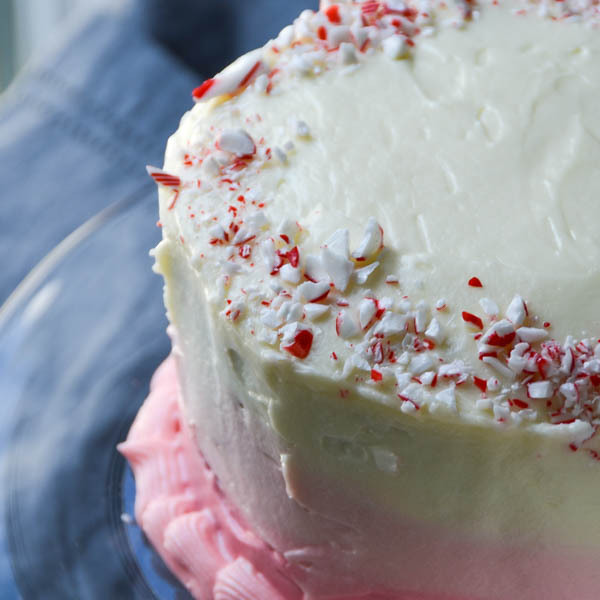 Now, let’s talk frosting, icing… whatever you want to call it. This one is of the cream cheese variety (Emily’s request). A simple, but indulgent and lip-smacking version that’s made refreshingly minty with a teaspoon of peppermint extract. You could easily just frost the cake without any embellishment and be perfectly happy. But it was her birthday — and it is Valentine’s Day – so I gussied it up with an ombre. Start by slicing the cake in half and frosting the bottom layer. 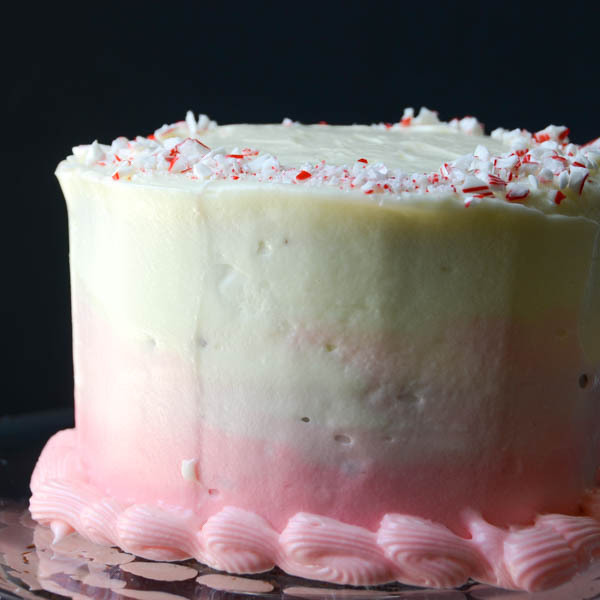 Sprinkle the icing with crushed peppermints and top with the other half of the cake. Frost the very top of the cake with a few spoonfuls of the cream cheese frosting, then divvy up the rest into 3 bowls. Tint one a light pink and the other a darker pink. 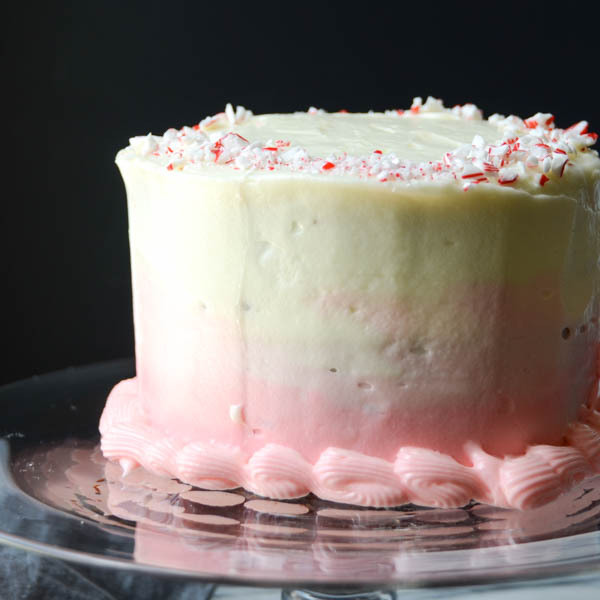 Start by piping a thick layer of the white frosting around the top third of the cake. 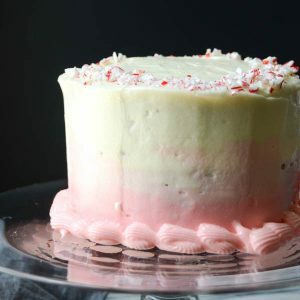 Next, pipe the light pink around the center third and finally the dark pink around the bottom third of the cake. Then run an offset spatula evenly around the whole thing. Ta-Da! You can’t imagine the ooh’s and aah’s I received when Emily saw this! And yes, it’s THAT GOOD! I know -- cake in a crock pot? But you can! Really! And this is the chocolatiest, moistest, best recipe ever! The mint makes it over the top! 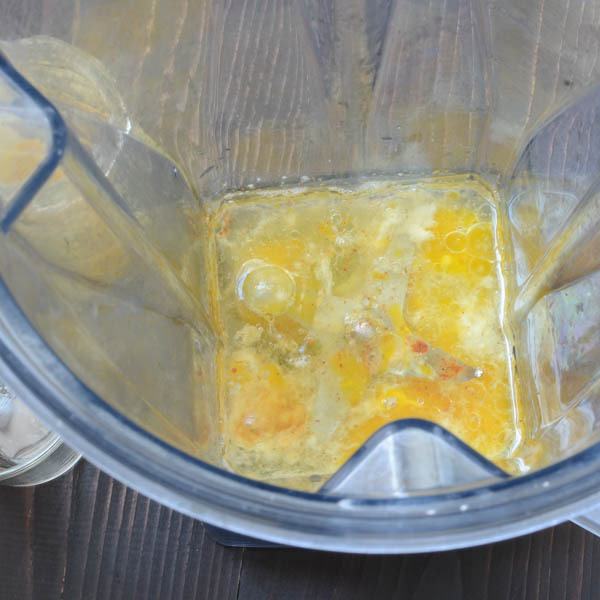 Into a blender add the egg, mustard, salt, sugar, lemon juice, cayenne and 1/3 cup of vegetable oil. Blend until just combined, then on medium high speed add the remaining 2/3 cup of oil in a slow drizzle through the top opening of the blender until thick and creamy. Grease and flour your cake pan. For extra security, cut a round of parchment paper to fit the bottom of the pan and spray the parchment with vegetable spray. Set aside. 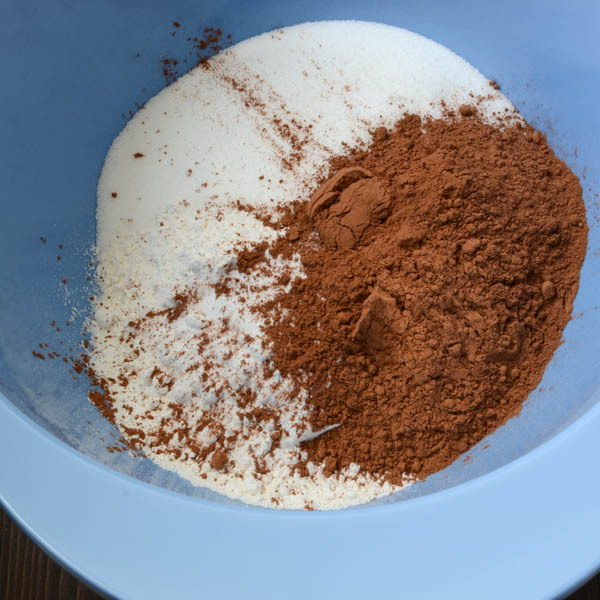 Combine the flour, baking soda, sugar, salt, and cocoa powder in a large bowl and whisk to combine. Add the mayonnaise, hot water and mint extract. Beat on medium speed with a hand mixer for 1-2 minutes, until well combined. Pour the batter into the prepared cake pan and secure with the cake pan lid or tent loosely with tin foil vented with small slits. Place the crock pot lid on the crock pot and "bake" for 2 1/2-3 1/2 hours until cake tester comes out clean. Cool to room temperature on a cake rack, then turn cake out onto a plate to frost. 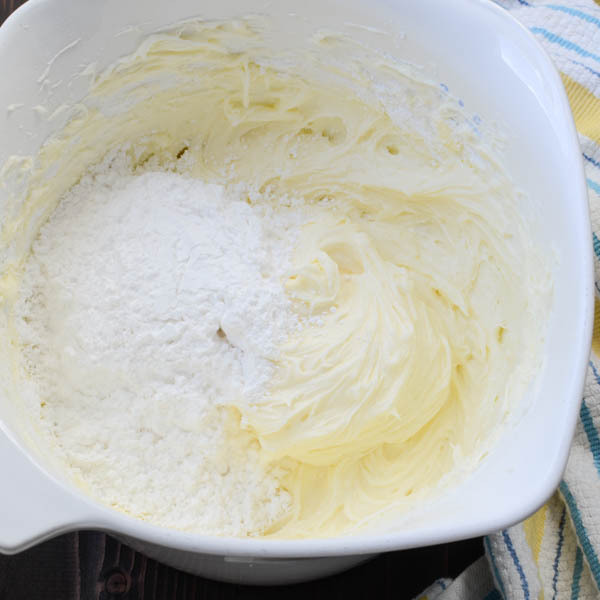 In a large bowl, combine the cream cheese and butter. 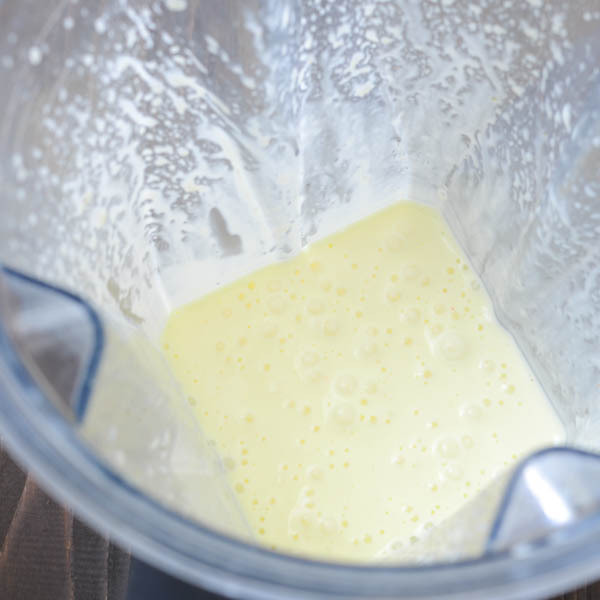 Mix on medium high speed with a hand mixer until well combined. Add the peppermint and vanilla extracts and powdered sugar, 1 cup at a time beating until smooth. 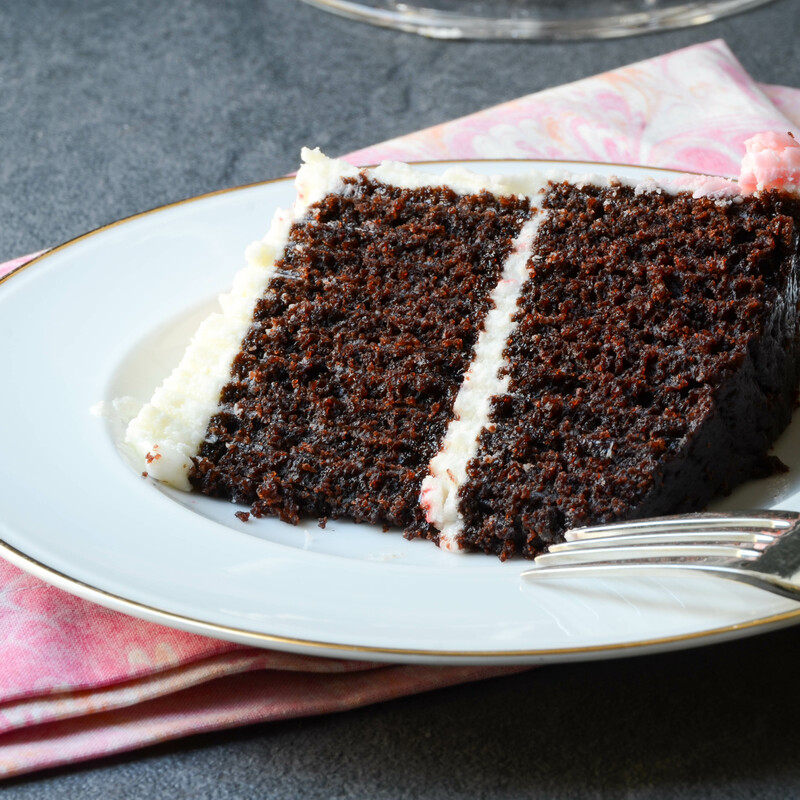 Use a long serrated knife to slice the cake in half making two equal rounds. Add a few tablespoons of icing to the bottom round and using an offset spatula, spread it evenly over the cake. Place the other half of the cake on top of the first tier. Set aside. Divide the remaining frosting equally into 3 small bowls. 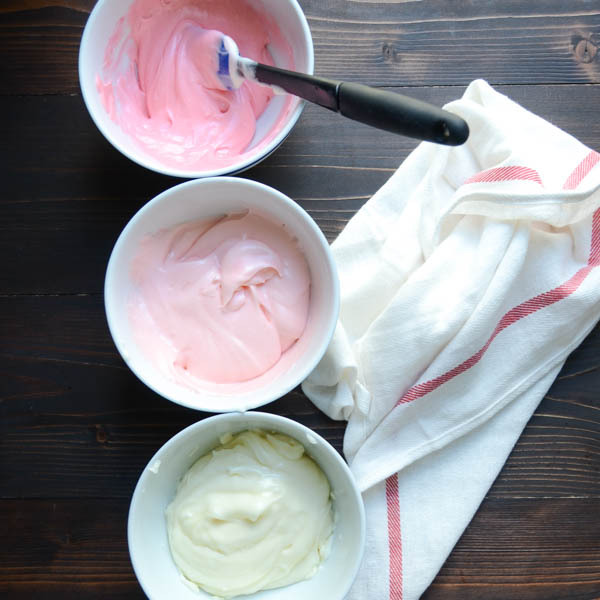 Set aside one bowl of frosting with no food coloring added. Add 1 drop of food coloring to the second bowl. Add three drops of food coloring to the third bowl. 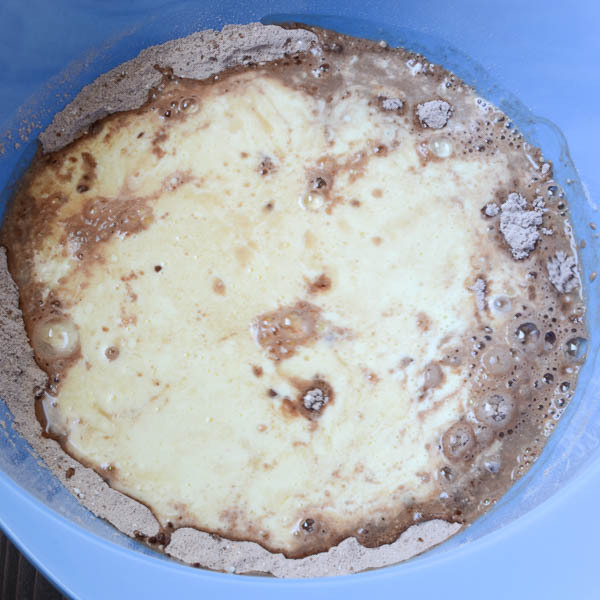 Mix each bowl well so that you have gradually darkening colors. Start with the white frosting Put several spoonfuls on top of the cake and use your offset spatula to evenly cover only the top surface. Transfer the rest of the white frosting to a pastry bag fitted with a large round tip. Pipe the white frosting over the top third of the sides of the cake. When you've used all of the white frosting, add the lighter pink frosting to the bag and pipe it around the next third of the cake. Then add the dark pink frosting and pipe it around the lower third of the cake. Note - when piping, depending on the size of your piping tip, you may have to make serpentine lines to loosely cover each third of the cake. Use your offset spatula to create the ombre effect. Hold the spatula vertically from top to bottom firmly against the cake and gently turn the cake plate around. This will smush the icing flat against the cake and the different tones will naturally run into each other creating the effect. Continue to spin the cake until the sides are completely coated. Switch the round tip to a star tip and pipe any remaining frosting around the base of the cake . 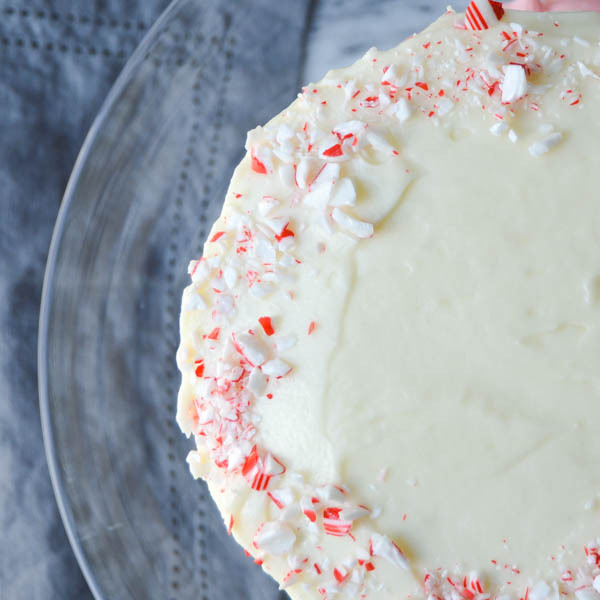 Sprinkle crushed peppermint candies around the top rim. My grandmother gave me her crock-pot cake pan which is essentially a tall round pan with a vented lid -- It fit her crock pot from the 1960s which was more vertical than today's modern crock pots. To jury-rig one for your crock pot, find a cake pan that will fit comfortably inside your crock pot. After filling the pan with batter, loosely tent aluminum foil over the pan and cut several vents in the top -- being careful that the foil isn't too close to the batter - you don't want it to stick to the foil as it rises. Bake covered in the crock pot for 2 1/2 - 3 1/2 hours. After the first 2 1/2 hours, use a cake tester to check doneness. If it comes out dry, it's done, if batter is wet and sticks to the tester, give it an extra 1/2 hour to an hour. Wow, cake in a crockpot? Who knew? It looks so moist and fudgy too! Beautiful! It is all of those things, Jenn! 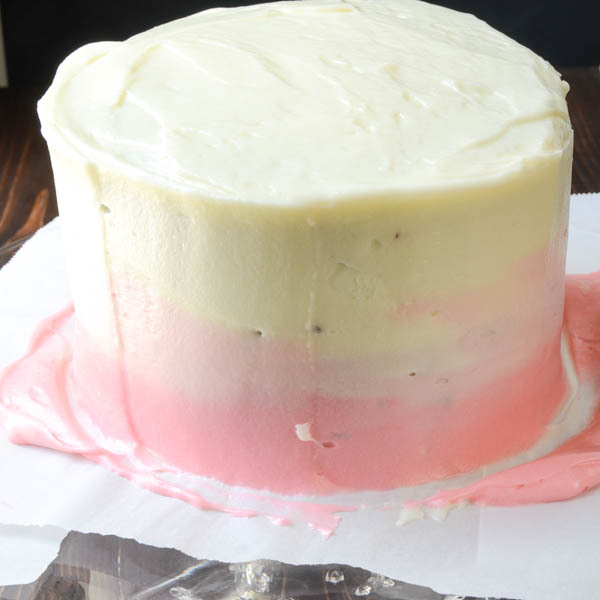 I confess to not being a great cake decorator – so if I can do the ombre — anyone can. And yes – crock pot cakes was a “thing” back in the day — and it still works! I’m intrigued. I’ve never heard of making a cake and a crockpot but this is a genius idea. I love the flavor and it would be perfect for Christmas time. 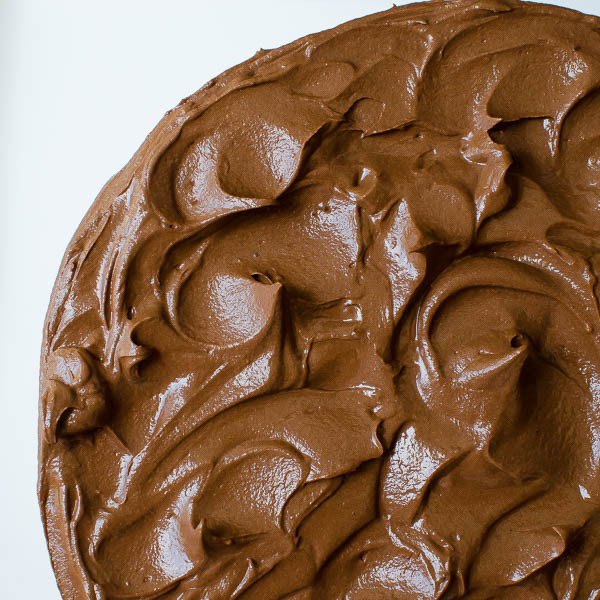 I know it sounds out of left field, but you will not believe how fudgy and moist this cake is. The crock pot method really works, too! Cake in Crockpot? Sounds so interesting. Must be worth because of the time and effort it takes. Hats off to you. It takes a little time, but it’s not hard! Oh wow! 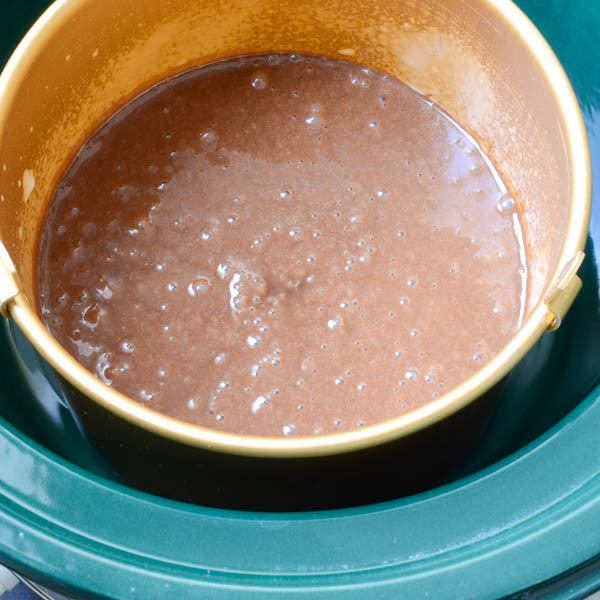 Who knew you could make cake in a slow cooker?!?! Definitely need to give this a try sometime. It is insanely moist, too, Giselle! Lisa this recipe has me excited on so many different levels. First the homemade mayo! Awesosme! And cake in a crockpot? So cool! 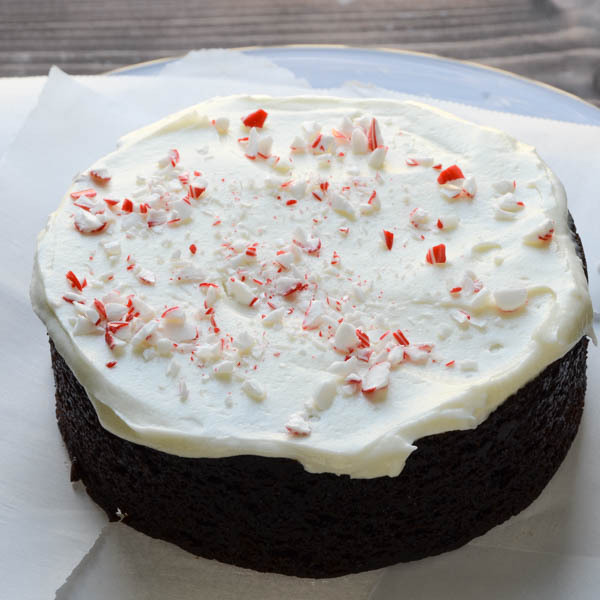 But what I’m most excited about is the moist chocolate cake with the peppermint frosting! Heaven in a fork! I’m glad you like it — my daughter has requested that I make the cake again for her birthday this year! This cake has me drooling ? I don’t own a crockpot (I prefer my pressure cooker for everything instead) but your recipe makes me want to consider a new kitchen gadget. And the ombre effect that you manage is something I would have to work towards. When I make food, it’s invariably tasty but “making it pretty” is something I am still working on. I believe you are right when you say, that perhaps it’s the combination of both, the make-shift mayo and the low cooking temperature that ensures moist-ness in the cake. I have tried similar hacks in the oven with super low temperature and I have avoided the nasty domes too. I for one, love the way your cake turned out. Pinning it for use. I love my pressure cooker too, but the slow cooker has its place. Glad you like the ombre effect. I wanted to do it for my daughter because she had recently colored her hair in an ombre – and I thought she’d appreciate it. And I’m by no means an expert of making food pretty. Luckily taste translates regardless! I’m “ooo-ing and ahhh-ing,” too! This is so pretty – I love it! I’ve never heard of making a cake in the crock pot! How interesting! 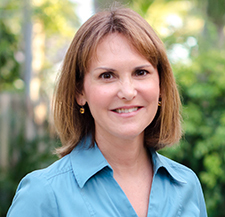 Thank you, Patricia. It’s nothing new – actually, this was a “thing” back in the day — like jello molds and tv dinners. I use my slow cooker all the time but have never for dessert. Looks like I’ll have to try this! My daughter was skeptical until she tasted it — over-the-moon! Lisa, vintage Rival cake pans for crockpot, are easily available on ebay…. Unfortunately I gave mine away when we moved…now I wish I’d saved it! Glad you like it – my daughter devoured this cake! I’ve never heard of baking a cake in the crockpot – how neat! This cake looks incredibly moist and delicious! The ombre effect is beautiful too! Thank you Katrina. I try, but I’ll never be as accomplished as you!